Long time no see, friends! As a longtime blogger, I've outgrown the Blogger platform and have started the process of moving "Growing Up Southern" to WordPress... please come on over and join me at http://www.ncsulilwolf.com/. Things are a mess over on the new site, but I've got plenty of downtime for the next four months to spiff things up - and you can find out when you mosey over and check out the new posts coming later today! I'm Finally Going to Pepper Fest! 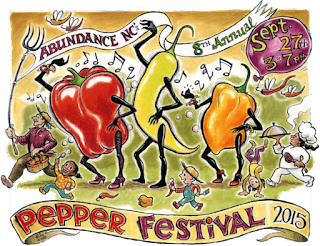 Billed as, "(The Amazing Pepper Festival is) a celebration of sustainable agriculture, farmers, renewable energy, and the creativity of the Piedmont’s chefs, brewers and artisans. An afternoon of fun, food, children's educational workshops, breweries, distilleries, music and entertainment! ", I'm pumped to make the 20 minute trek over to Chapel Hill for my first taste of the fest. Be sure to tune in on Instagram and see just how much heat this girl can sample in one afternoon. So here's what you need to know - especially if you might be able to find yourself in Chapel Hill on the afternoon of Sunday, September 27th! Live music - The Stacks are playing! Tania Elizabeth (of the Avett Brothers) and Andy Stack. Participation in fun activities for kids and adults about local farms, renewable energy, and the abundance of great local food in and around the Triangle! Who is Abundance, you might ask? They're "About Us" page reads: "At Abundance, we aim to be a hub of community resilience in central North Carolina, sourcing out the abundant local opportunities for us all to live and act sustainably, and bringing people together to exchange ideas and build the communities we want to live in." Quite simply put, the group believes: "We don’t have to rely on goods and services brought in from elsewhere to eat well or to live fulfilling lives. We have everything we need to create a flourishing and interdependent community, right here at home." Local and sustainable. I am definitely down with that. Add peppers and afternoon cocktails? I'm in. You'd think a small town like Garner would really embrace the local indy business movement, but the busiest places on the weekend are almost always chain concepts - that's why i'm really excited to share a few new places that are earning my local dollars. This business isn't as new as the following two (maybe around for a year or so, already? ), but what Kara is doing here is pretty innovative. Yoga + wine = in one place. Get your yoga on at this Aversboro Square studio and then after class, enjoy samples of wine, indulge in a glasses, or take a few bottles of wine home to enjoy. Occasionally, Kara has even turned the studio into a pop-up dinner venue with featuring the culinary talents of Chef Joe from Backyard Bistro and the wine knowledge of Cory Sloan from Tryon Distributing. I've taken several yoga classes here with both Kara and Mary and have enjoyed all of them. And I love the variety of days and times that they offer classes. Sunday afternoon zen session? Yes, please! And yes, of course, I've also sampled the wine and thoroughly enjoyed that too. :-) Check out the class and event schedule schedule online at http://zinyogawine.com/. Namaste, y'all. Just down the street from Zin is The Beerded Lady Bottle Shop, Garner's first (and currently only) craft beer indy retailer! (Kroger grocery store doesn't count, kids.) Gal pal Adrianne and I popped in last Sunday after yoga to check this spot out. It had just opened that week, so they were still getting a lot of things worked out - like the right inspections and permits to be able to serve flights and ciders. All good things to look forward to as this new business grows. In the meantime, grab some friends, family and neighbors and taste your way through their draft menu - which is fun to do 5 ounces at a time... a unique offering I haven't seen before in this area. Read up on what's available at thebeerdedlady.com and then visit them in the 5th Avenue shopping center. We were on a tight schedule when visiting and didn't get a chance to try any food from the menu, but are looking forward to getting back for a visit soon. There are actually quite a few vegetarian-friendly items for me, including a "build-a-burger" option that has a veggie burger base choice! No website yet, but check out updates from their Facebook page at https://www.facebook.com/Kraftysburgersandbrews. Click here for more pictures from Krafty's! Are there any other new, locally-owned businesses in Garner that I need to check out next weekend? Let me know in the comments below! Having grown up just a few miles from the intersection of Tryon Road and Cary Parkway, I've seen a solid handful of businesses come and go from the corner free standing building in the Wellington Park shopping center. This is the first that I think has a real shot of lasting! Chanticleer Cafe & Bakery is open seven days a week from 7:00 a.m. until 3:00 p.m., and I've read that they hope to expand into evening hours, too. Visit them at 6490 Tryon Road in Cary. I asked for four sweet bakery items (manager's choice) to be packed in a to-go box to send home with my client who I was meeting with after lunch. The total bill for my sandwich and side, plus the sweet goodies to go, was less than $20. Save Room for the Sweets! On a second visit about a week and a half later for brunch/lunch, the Manfriend, my parents, and I all ventured around the menu. Johnnie and my dad both enjoyed breakfast sandwiches served with Ashe County Cheddar, eggs, and bacon on croissants. Mom ordered a salad and it was so large, she took half home for later. I ordered the Caprese panini (Italian Bread brushed with Olive Oil and filled with Basil, Fresh Mozzarella and Sliced Tomatoes) and although it was good and exactly what you'd expect with basil, mozz, and toms, the Apple & Brie still ranks above it for me. This time around, we ordered a French Chocolate Silk Tart which was served basically as a mini-pie. Although the crust was a bit too tough to break with a fork easily, it didn't our four-some from cutting it up into smaller bites and devouring it. The chocolate silk was true to form - super light, yet rich, and a perfect end to the meal - even though we did sneak a few bites early after we sat down and were waiting for our sandwiches and salads. For all four of us, plus the single dessert, the total bill was about $40. Each time I've been, there have been equal amounts of diners enjoying the outside seating as well as inside. I've never had to wait long and on each visit, the service has been friendly. According to the N&O's food writer, Andrea Weigl, the bakery is owned by chef Craig Freeman, a longtime Raleigh caterer and owner of Edible Accolades. If you're local, stop in soon and let me know what you think of this new local spot in the comments below! This is one of Johnnie Bud's absolute favorite things for us to have in the refrigerator so he can snack on it anytime, add it as a relish to burgers, or enjoy as a side item. The best part about this dish is that it's really easy to modify based on what you've got in the freezer/cabinet and based on your personal taste. 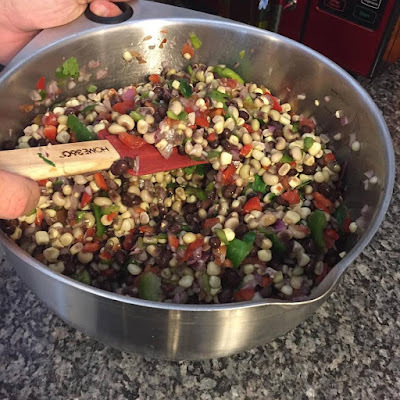 Mix everything and refrigerate overnight to let it marinate well - although you can start eating anytime, the onions are raw though and have a lot of bite until they've marinated. Since the corn and pink eyed peas were fresh from the farmer's market, I boiled them until soft and then cold-rinsed them before mixing everything together. If you buy canned, just drain and mix in. PS: We had green peas with dinner tonight and had some leftover, so I threw them into the big bowl of Redneck Caviar for extra color and another tasty flavor. A few weeks ago I was invited to the premiere of Blueforest Studio's inaugural "Blueforest Gives Back" non-profit video project. It was the first time I've heard about the great work CASA is doing in the Triangle, so I'm excited to share today both the video and an upcoming fundraiser event the organization is hosting that looks fun and won't break the bank for donors! 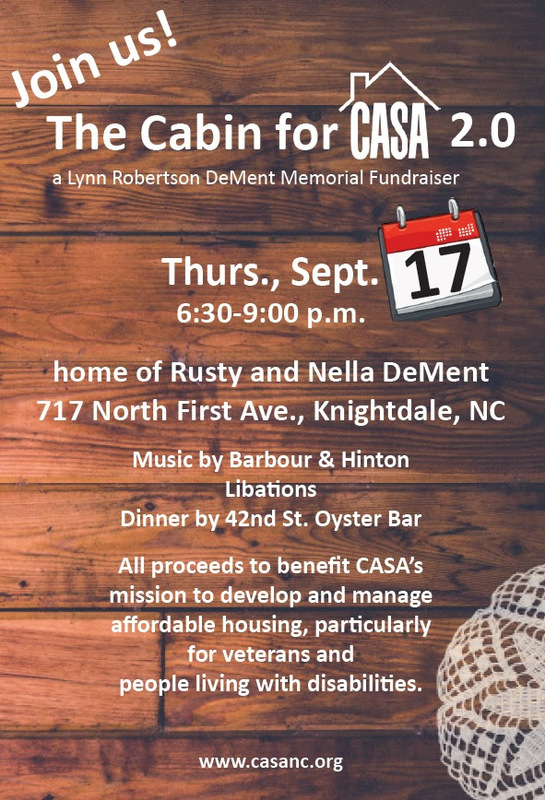 Join us for The Cabin for CASA 2.0, a Lynn Robertson DeMent Memorial Fundraiser! All proceeds to benefit CASA’s mission to develop and manage affordable housing, particularly for veterans and people living with disabilities. In 2014, the first annual Cabin for CASA raised over $30,000 to support CASA’s mission. Mark your calendars to join us this year! Click here to buy tickets, support the sponsors of this event, and more at CASA's website. I had the chance to experiment with these two recipes the last few months and they are not just "Manfriend Approved", they are straight up "Manfriend Loved"! The original website, http://www.stockpilingmoms.com/2012/04/pinterest-pin-of-the-day-meatloaf-in-a-muffin-tin/, lists lots of meatloaf recipes and I chose to go with the Paleo one this go around. It didn't disappoint and I felt like it was a moderately "healthy" switch to make on the manfriend... who didn't enjoyed it regardless of fad diet title. The only changes I made were removing the minis from the muffin pan and putting on a broiler pan for the last few minutes so all of the juices that had piled up would run off and to crisp the bacon. Manfriend even revisited these for leftovers on another day, so clearly that's a win. I picked up raw pizza dough from our neighborhood pizza restaurant on the way home and even though the crust got a little away from me when transferring to the baking stone, this pizza tasted so good we didn't care what the squiggly edges looked like. This is rich, so serve it by the slice with a salad on the side... if you can resist eating the whole thing! I'm pretty passionate about this topic because I personally feel that food insecurity and hunger are the most embarrassing issues facing North Carolina right now. We aren't lacking food. (Thanks, farmers!) We aren't lacking the money, resources, and science to solve this problem. (Like cancer, etc.) This is a fixable issue facing hundreds of thousands of NC families, children, seniors and individuals. This is literally the easiest food drive you've ever participated in. Simply pick up some extra canned items when you grocery shop this weekend or next week and just leave the extras at your mailbox. So plan on joining in on Saturday, Nay 9 - no matter where you live! Pack a bag of food and set it by your mailbox on Saturday, May 9! Your local letter carrier will do the rest. Although this is a national food drive, all donations made within our region come to the Food Bank of Central & Eastern NC. Donated items are provided to the more than 651,000 children, families, and seniors in our 34 counties who are food insecure. I love live music. I love a great cause. And I have an especially soft spot in my heart for this event because it's where I fatefully bumped into Johnnie Bud just three years ago and our first date was soon after. #BandTogetherLoveStory right here, y'all. 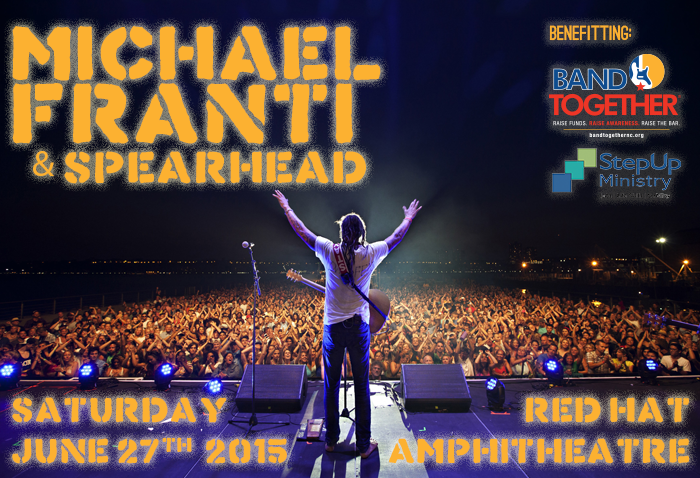 Needless to say, you'll be seeing me on Saturday, June 27, when Band Together's Main Event takes the stage in downtown Raleigh at Red Hat Amphitheater with Michael Franti & Spearhead. I hope you'll join me in helping Band Together reach their lofty, but attainable, goal of raising $2,000,000 for Step Up Ministries, a non-profit dedicated to helping low-income homeless individuals in the Triangle area become self-sufficient. The Foundation has recently launched the SuperKids Cape program for children with critical illnesses. 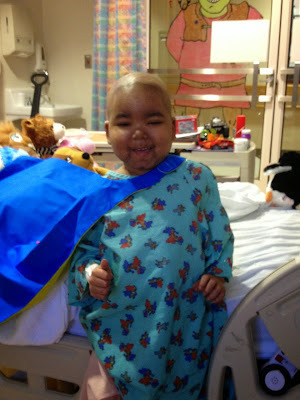 According to board member and all around good guy Richard Averitte, "The Me Fine Foundation wants to bring attention to these unbelievable little people and their superpowers by adorning them with garments fits for a superhero; so we provide them with SuperKids Capes." Yoga + Wine... IN GARNER! Yes, you read that wonderful combination right and I'm just as surprised as you are to find out it's only a few miles from my house. Vino and Vinyasa Saturday, January 31st: 6 p.m. until 8:30 p.m.
Yoga with friends, wine and chocolate will sure to make a memorable night out. The night will start with a long gentle practice and end with a glass of wine, delicious tapas, and Togomay truffles and gluten-free cookies. 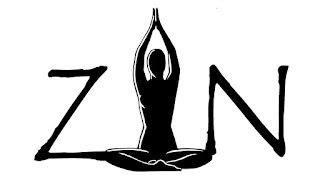 This is the true experience of Zin Yoga Studio and Wine Lounge. $35/person. Must Preregister by Thursday 29th. Texas Caviar. Redneck Caviar. Southern Caviar. Redneck Salsa. I've seen recipes of this variety called a lot of different names. No matter what you call it, or what combination of flavors you include, it's probably going to be ridiculously addicting. A few cans of beans, several cut peppers, herbs, garlic, red wine vinegar, olive oil and boom. Delicious mixed up in a bowl and no cooking required. Put it in the 'fridge for an hour and it's ready to go or leave it overnight to really marinate. We snack on it for days and while it doesn't last more than two days due to constant enjoyment, I'm not sure it would really even go bad for a few days long as long as you keep it chilled. This is a tailgate must and a quick mix for anytime in between football seasons. 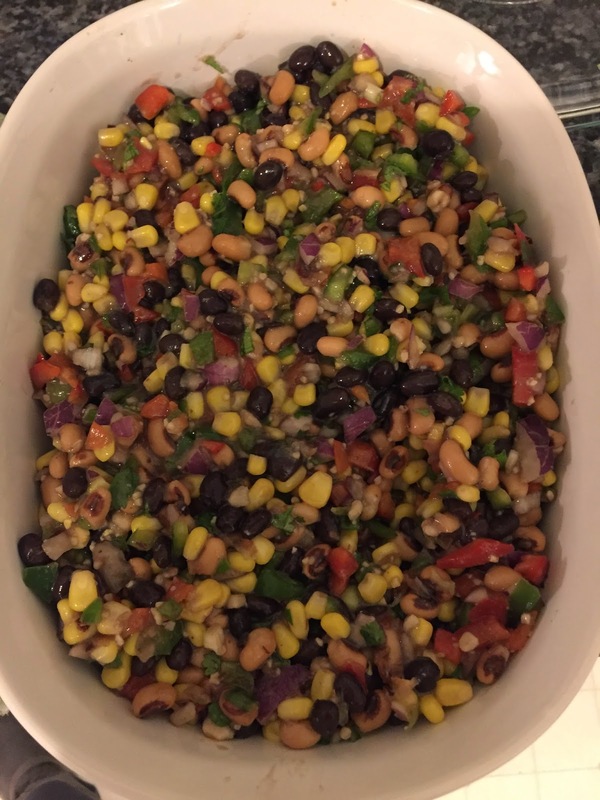 It's delicious with tortilla chips, as a salsa/relish, as a side dish... practically any way. 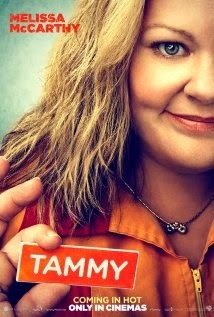 Ignore the IMDB.com ratings for Tammy and rent this movie for a dollar at Redbox this weekend - it was hilarious! Johnnie Bud and I had a Redbox night this past weekend and picked this one because we're Melissa McCarthy fans - we enjoyed Identify Thief so we picked this one up without even seeing a trailer for it. What we had no idea we were in store for was the awesome cast that filled this comedy with a happy ending: Susan Sarandon, Kathy Bates, Allison Janney, Dan Aykroyd, Mark Duplass (recognized him from The League) and more... all so funny! There was nothing incredibly intelligent about the movie, but I can't remember the last time I've laughed so hard, so many times in a movie. If you're looking for a cheap laugh, this is the rental for you. Enjoy! PS: It's not kid-friendly. Enjoy it for date night, not family night. It allows you to opt-out of the selling of your information for this purpose for five years if you fill out the form on the website, which requires your social security number (submitted securely). If you take literally two extra minutes and the cost of a stamp, you can permanently opt-out via postal mail. I did this years ago and it has cut the crap in my mailbox in half. So worth repeating - go to OptOutPreScreen.com and get off those credit card offer mailing lists once and for all.